The MC720-DA is our high security, heavy-duty front load cabinet made with heavy gauge steel and two t-handle locks. 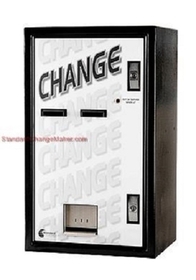 It is a great machine that can be used in commercial coin laundries, arcades, zoos, aquariums, haunted houses, batting cages, and miniature golf courses. With two steel coin hoppers, holding up to 6,400 quarters ($1,600 capacity), the MC720-DA can dispense coins, tokens or a combination of coins and tokens. Some customers have set up the MC520RL-DA to dispense a combination of quarters and dollar coins.